Are you wondering if a Rottweiler Boxer mix puppy is right for you? 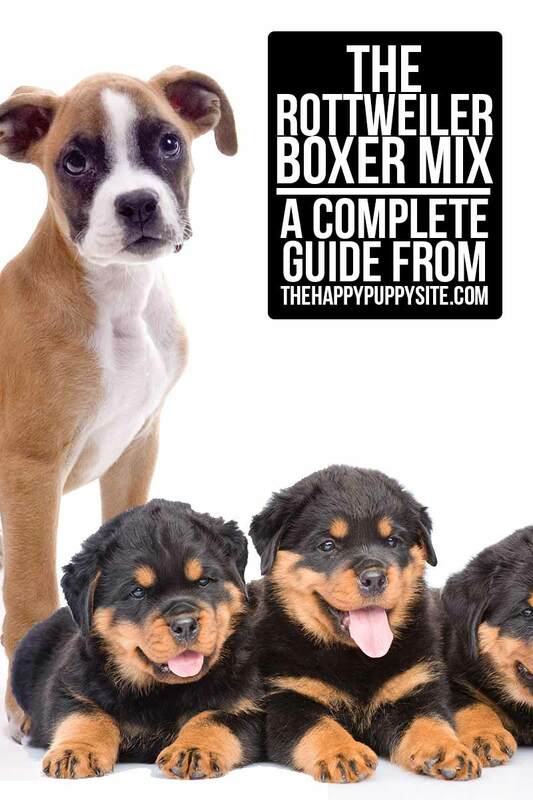 Welcome to our complete guide to the Rottweiler Boxer mix! The Rottweiler Boxer mix is the result of a Rottweiler cross Boxer. If you are considering this breed, looking for Boxweiler information, or are looking directly for Rottweiler Boxer puppies, you’ll find the information you need right here! The Rottweiler Boxer mix, or Boxweiler as it’s commonly called, is a muscular, sturdy dog with an active and loving personality. A mix of two large dog breeds, this is a sizeable dog that can reach up to 100 lbs. We’ll go over all the information you need on the Boxweiler, but first, let’s take a look at the controversy that sometimes surrounds “designer dogs” like this crossbreed. There is an ongoing debate over the ethics of “designer dogs” such as the Rottweiler Boxer mix. Some claim that pedigree, purebred breeds are superior due to their consistency and predictability. Many also claim that cross breeding dogs is too akin to “playing God,” particularly when it comes to the work of amateur breeders. On the other side of the aisle, many breeders and fans of the crossbreed claim that there are significant benefits to designer dogs. There are some legitimate potential health issues with purebred dogs – often caused by years of inbreeding – which can sometimes be reduced through cross breeding. Cross breeding advocates claim that there can be some benefits to genetic diversity in dog breeds, often pointing to the “hybrid vigor” phenomenon as evidence. No matter which side you take, it’s good to remember that every dog was crossbred at some point in history, whether intentionally or not. With or without human intervention, crossbreeds are inevitable. There’s no right answer to the purebred vs mutt debate. Each side of the argument has valid points. Ultimately, it all comes down to the breeding process, the knowledge of the breeder, and the genetics of the parents. Certain cross breeds are prone to specific behavioral and health issues, but the same could be said for certain purebred dogs. Thus, it’s very important to do your research before selecting a breed. When it comes to the Rottweiler Boxer mix, there are some significant potential health problems, so it’s important to be aware of any potential issues before you get a dog. One important thing to keep in mind with any mixed breed dog is that there will always be some unpredictability. You really won’t be able to know for sure what characteristics – physical and behavioral – that the dog will take on once it’s fully grown. You can make some educated guesses based on the genetics of the parents, but ultimately, you won’t know which breed will end up being the dominant one. Mixed breeds will always take on some of the characteristics of both parents – what the mix will end up being is anyone’s guess. Thus, when considering getting a mixed breed dog, it’s wise to look closely at the parent breeds, but at the same time recognize that there will always be some unpredictability in the final outcome. To get an insight into the Boxweiler breed, let’s first take a closer look at each parent breed. The Rottweiler’s origin is somewhat muddled, without clear records. It is thought to have descended from the Drover dogs of ancient Rome. It is likely that the Roman army brought the Rottweiler’s ancestors into Switzerland and Germany, where they are thought to have mixed with local breeds such as the Bernese Mountain Dog and the Appenzeller. Although evidence of this breed dates way back to the 1600’s, the first official breed standard was not produced until 1901. It was added to the American Kennel Club registry in 1931. The Rottweiler is a working dog, used throughout history for bear hunting, police work, cattle herding, and even to pull carriages for passengers. The Boxer breed originated in Germany in the 1600’s. It is descended from the Tibetan line of Mastiff (which in turn was a descendent of the Molossus). The Boxer name is thought to have originated from the breed’s fighting style, which uses its paws in a way some view as similar to a human boxer. The Boxer gained popularity in Europe throughout the 1800’s, and was officially recognized by the American Kennel Club in 1904. Today, it’s ranked in the top 10 most popular dog breeds. Despite the popularity of the two parent breeds, the Boxweiler cross breed was not established until the 1980’s. It is not clear where the cross breed originated from. The Boxweiler is a large dog with a strong, muscular build. A full grown Boxweiler will typically weigh between 60 and 80 pounds – although reaching up to 100 lbs is not unheard of. They are typically happy, healthy pups with an average lifespan of 8 to 13 years. As for physical appearance, the breed can take on characteristics of either parent. So, it can end up looking like either parent breed. The one, mostly uniform characteristic is a large, square head. The Rottweiler has a stocky, muscular body, while the Boxer has a lean, muscular build. A Boxweiler could take on either of these body types, or somewhere in between. Again, it’s important to remember that you won’t really be able to predict how a mixed breed dog will look. If you can meet the dog’s actual parents, that will help – but you still won’t know which characteristics will be dominant in your pup. The Boxweiler is an active, happy dog. Full of energy, these pups are highly intelligent and loyal. They are typically friendly, but can get quite protective and will keep a close eye on strangers. Boxweilers are working dogs, so they tend to enjoy having some sort of role to fill. Whether that’s protecting the family or working as a police dog, Rottweiler Boxer mix have a deep sense of duty, loyalty, and love to any given job. Rottweiler Boxer mix dogs are loving and affectionate, and enjoy human interaction. They are moderately dependent – meaning that they can be left alone, but they are prone to separation anxiety if left on their own for long periods of time. Boxweilers are usually good with other dogs, although early socialization is key. They are very good with children, so long as they are socialized properly. The Boxer Rottweiler has a short, thick coat with a somewhat harsh texture. Their colorings vary, but are almost always a shade of brown. Mixed brown and black spots are also possible, and they will sometimes have a white splotch on their chest or belly. Boxweilers are moderate shedders and should be brushed about 2-3 times per week. Although they are short haired, they can still shed quite a bit all year round. This breed requires moderate grooming in order to keep its rough coat in good shape. They tend to stay relatively clean thanks to some self-grooming habits, but will still require regular baths at least once a month. The biggest factor to consider in terms of Boxweiler care is that these are very high-energy dogs who will need a LOT of exercise. We’ll cover this in a dedicated section below. The Rottweiler Boxer mix is a byproduct of two highly energetic, working dog breeds, so it’s no surprise that these dogs have some serious energy! Boxweilers need to be walked at least twice per day, and ideally should have a fenced yard to run around in. 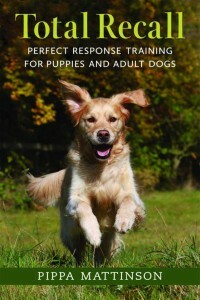 They enjoy playing with other dogs, so long as they are properly socialized and not aggressive. They also tend to gain weight if they don’t get enough exercise. It’s important to monitor your dog’s weight and increase exercise and/or reduce food if you notice unhealthy weight gain. The Boxweiler is overall a fairly healthy breed, but that’s not to say it’s not prone to some potential health problems. 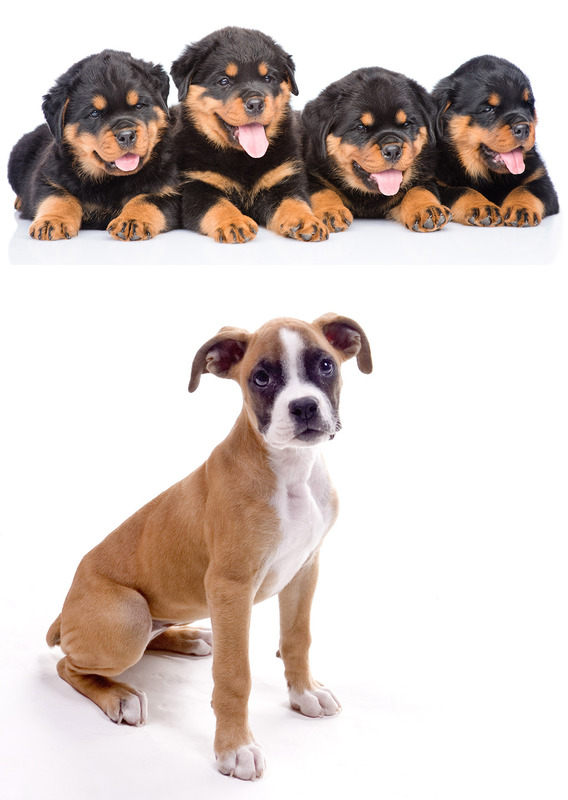 A Boxweiler puppy can take on any of the attributes – positive or negative – of either parent. Boxers are more prone to heart conditions, cancers, hypothyroidism, hip dysplasia, and degenerative myelopathy. Rottweilers are more prone to eye problems like cataracts, heart problems, gastroenteritis, hypothyroidism, and other conditions. Since both breeds have a tendency for heart problems, this should be one of the primary concerns for new Boxweiler parents. Several heart conditions are possible, but the most serious is probably Arrhythmogenic right ventricular cardiomyopathy – a condition that can be fatal. Weight gain is another common issue with this breed. Rottweiler Boxer mix dogs can put on weight quickly. If not exercised enough or if overfed, they can become overweight. Canine obesity can also increase the risk of other health problems, particularly relating to the heart. Some other potential health issues include joint dysplasia, hip dysplasia, allergies, mange, pano, cancer, heart defects, bloat, eye problems, and deafness. 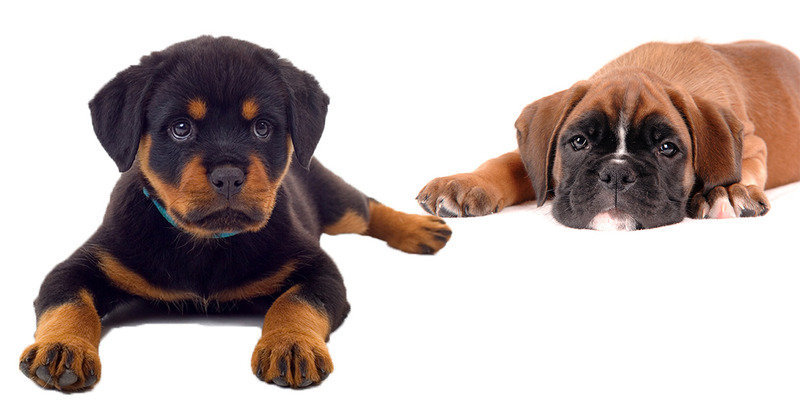 If you’re looking at Rottweiler and boxer mix puppies and considering adopting one, it’s important to consider whether or not your home will be ideal for this breed. The biggest consideration is the energy level of these dogs. Boxweilers need regular exercise, at least twice per day. They also should have plenty of space to move around, so a small apartment is likely not suitable for this breed. Beyond that, consider the fact that Boxweilers are prone to separation anxiety. If you work long hours and will need to leave your dog alone all day, this breed is probably not going to be the best choice. Overall, the Boxweiler is a friendly and social breed. They are great with children, so long as they’re properly introduced and socialized. Boxweilers are protective without being overly aggressive. They can make very good guard dogs and will not hesitate to protect your family should the need arise. Prospective Boxweiler parents should weigh the pros and cons of the breed – including potential health problems – before making their decision. If you are searching for boxer and Rottweiler puppies, it’s very important to seek out reputable Boxweiler breeders. 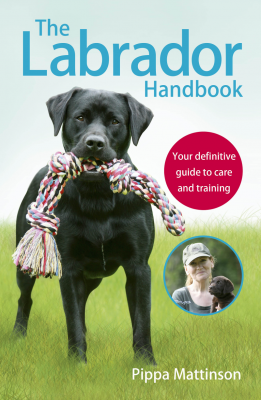 An experienced breeder will know the proper techniques for breeding healthy, happy dogs. They will likely test the parents for potential health problems, which helps to reduce the risk of health concerns in the puppies. When you locate a breeder, ask to see any health certificates or test results that they have for the parents. Also, if possible ask to meet the parents so you can get a better idea of what your new puppy’s temperament might be like. If you can’t find a breeder in your area, you can of course look for a rescue dog from a local shelter. We wholeheartedly encourage adoption – but, it’s very important to be aware of the potential downsides. The main issue with adopting a dog is that you just don’t know what it’s been through before becoming your companion. It could have been treated poorly or abused, which could translate to aggression or unwanted behavior. With that said, every dog deserves a good home. If you are willing to adopt and accept the risks, we encourage it. 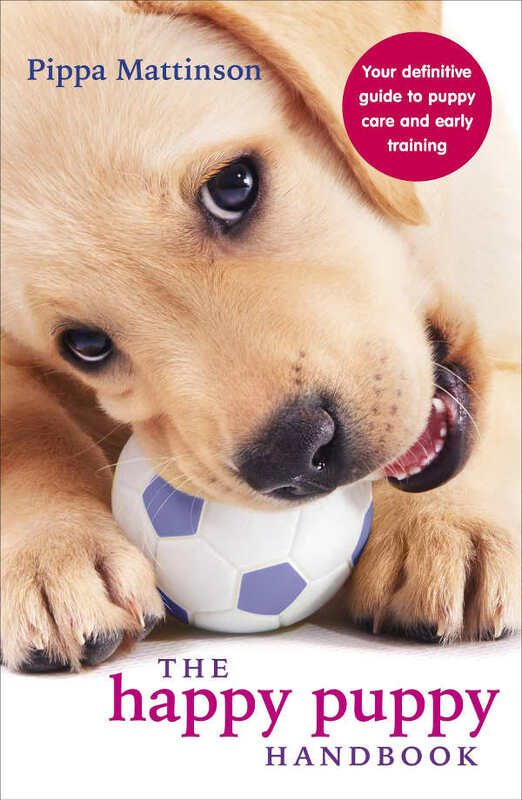 If you’d prefer to get a puppy to train it from a young age, be sure to seek out a reputable breeder. Dobson, J. Breed-predispositions to cancer in pedigree dogs. ISRN Veterinary Science. 2013. Meurs, K. Boxer dog cardiomyopathy: an update. Veterinary Clinics Small Animal Practice. 2004. Would love to find a very reputable breeder of the BoxWeiler! Why must you continue to breed dogs irresponsibly? If you want to raise pups do it correctly! Pick your breed, study health, longevity, disposition and breed standard. Go to shows and finish your dog proving it is breed standard while doing all recommended OFA health and DNA testing. 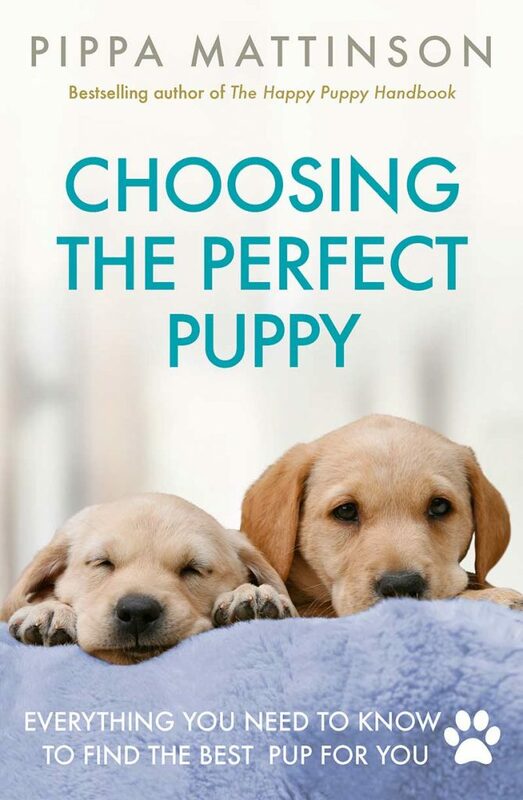 Choose a mate that is equal or better when you have approved homes for all pups. The point of breeding and showing is to IMPROVE the breed. Not destroy it as you are! As breeder of top quality show Boxers since 1968 I find the compulsion of some to mix two perfectly fine breeds to be pointless. Like most designer breeds the motive seems to be more monetary than to improve on any particular breed characteristic. Designer dogs (sic) mutts are regularly represented as rare and sold at inflated prices by breeders who do no health testing to native buyers. Purebreds from reputable breeders have the benefit of years of pedigree research and genetic testing. Crossing g breeds and breeding dogs with dilute factors can lead to heartache for unsuspecting buyers who want as healthy puppy of good temperament. Caveat Emptor. What a load of pretentious nonsense. Your “pure” breeds are the defining designer dogs. They’re human selected, not natural (sic) mutts. There’s nothing wrong with mixing two breeds of dog. It helps cover the genetic weaknesses of each (usually ones created by human breeders in the first place). Overcharging for a dog is one thing. But clinging to some sort of idea that dog breeds are cemented in stone or somehow superior to non pure bred dogs just makes my eyes roll. I rescued my Boxweiler at 9 weeks old. He weighed 7.5 lbs. His name is Copperpot. He will be 12 years old this June and weighs 96lbs.We live on a big farm and he’s an inside/outside dog (comes in goes as he pleases for most part). We’ve not ran into any heart problems as I’ve had him on a preventative medication and diet for such most of his life. He is however starting to have arthritic issues with his hips and elbows . I feel blessed we haven’t had to deal with any other issues thus far (knocking on wood) as the preventative care is seemingly doing well. I’ve found this mix to be the absolute best for the ease of training and his intellect is off the charts! Would any of you owners publish a picture of your dogs? Love to see them! FYI. Rotties also get cancer. I have had five. One died of heart disease, two from cancer. I’m sure the boxer/ rottie mix is cute but they both suffer from the same health issues. I don’t think its a great mix for heath reasons. Don’t go looking for a broken heart.